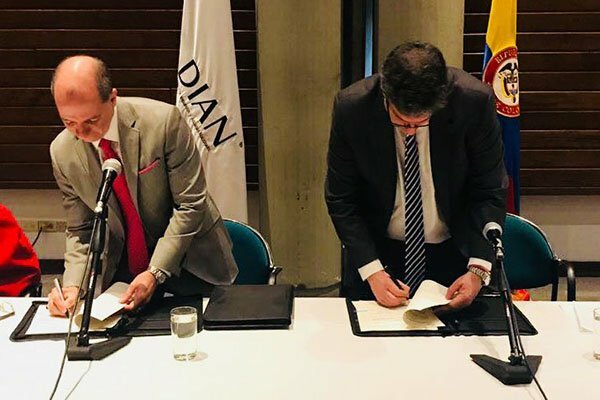 Colombia’s National Directorate of Taxes and Customs (DIAN) has today (23 May 2018) signed a Memorandum of Understanding with the Global Alliance for Trade Facilitation, to push forward a major customs modernisation project aimed at boosting international trade and implementing the WTO’s Trade Facilitation Agreement. The project will see the establishment of a new centre for trade facilitation and good practices, run by DIAN, which will issue advance rulings on the classification, valuation and origin of goods prior to their arrival at borders, significantly reducing waiting times and trading costs for importers and exporters. The centre will initially focus on the automotive industry, a key economic sector for Colombia, and will have a dedicated team with specialised knowledge and understanding of the needs of vehicle assembly companies and exporters. The project supports Colombia’s efforts to implement a far-reaching programme of trade facilitation reforms aimed at unlocking economic growth and creating new opportunities for Colombian businesses through international trade. There is already international interest from neighbouring countries in how the project is being developed and implemented, and the project team are optimistic that it will serve as an example of best practice in trade facilitation. The Global Alliance for Trade Facilitation which is supporting the project is a not-for-profit venture which brings together governments and businesses to identify opportunities to improve trade facilitation, such as reducing delays at borders and removing unnecessary red tape, and implement targeted reforms. Its unique approach, known as ‘co-creation’, is to involve the private sector as an equal partner of government, leveraging its resources and know-how and ensuring reforms directly address business needs. The process aims to develop a permanent and constructive relationship between the two sectors which will endure after the project. The project’s working group brings together representatives from DIAN and the automotive industry, including car importers and car assemblers, who have been instrumental in developing the blueprint for the new centre. The Alliance and DIAN signed a Memorandum of Understanding in Bogotá. Today’s signing cements commitment from both sides to delivering this game-changing project. Santiago Rojas, Director of DIAN, who signed the agreement on behalf of his agency, said that the project will decrease transaction costs for companies and optimise the resources of DIAN by standardising procedures.